The Vancouver International Film Festival is probably one of the only regional film fests in North America that plays host to three international regions. Layered in the festival’s large and lengthy program is a separate but equal focus of films from Canada, the U.S., and Asia. The Western Canadian city is a diverse destination all year long, but VIFF is the annual cinematic expression of Vancouver’s unique spot on the cultural map. VIFF is a festival where Canadian film icons such as Don McKellar (in town with opening night film “Blindness“) and Charles Martin Smith (here with his latest directorial effort “Stone of Destiny“) can be found holding court at various parties, while an encore presentation of Korean filmmaker Ji-woon Kim‘s “The Good, The Bad, and The Weird,” doesn’t just sell out; it’s oversold. Plus, the programmers offer Vancouver premieres of such American festival hits as “Ballast” by Lance Hammer and “Sugar” by Ryan Fleck and Anna Boden. The Film & Television Forum grew with Vancouver’s emergence as a desired location for Hollywood productions, tapping into the wealth of talent in the area to share experience and war stories with aspiring Canadian producers. While aggressive U.S. state tax incentives have hit the Vancouver production community hard in recent years, the Forum still manages to provide insight on overcoming the odds, while peppering it with some sobering realities. During a Thursday morning panel, Voltage Pictures producer Nicolas Chartier mused about his recent Toronto sale of “The Hurt Locker” during Toronto. While the film was critically acclaimed, and sold for seven figures to Summit Entertainment, he’s unsure of whether it will be profitable for him. Other non-festival projects, like a Steven Seagal actioner called “The Keeper,” have already turned a profit without even completing production. On a Saturday panel called “The Times They Are A-Changin’,” “Ballast” director Lance Hammer offered words of wisdom from a turbulent year getting his Sundance favorite in theaters. Hammer famously ended his pending deal with IFC Films, in favor of releasing the feature himself and maintaining ownership. The film opens this week in New York City, before rolling out to select cities. In Vancouver, Hammer appeared excited but exhausted about the prospects, and shared that he’s thankful with the amount of support he has received from veteran film distributors. 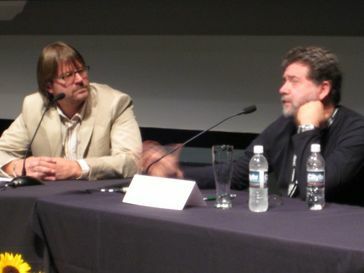 Vancouver filmmaker Scott Smith, left, interviews cinematographer Guillermo Navarro during a popular session at the Film & Television Forum. Photo by Matt Dentler. The VIFF Film & Television Forum delivered a treat with the “Directing Master Class,” where a collection of Vancouver-based veterans both inspired hope to first-timers while also highlighting the vibrant indie community existing in an otherwise Hollywood-driven film town. Local filmmaker Lynne Stopkewich recalled the process of making her acclaimed debut feature, “Kissed,” which was almost entirely supported by Canadian institutions. It would eventually be a critical darling, with a U.S. release by Samuel Goldwyn Films. “Kissed” began as a thesis film for the University of British Columbia, where she collected gear and crew. Then, the National Film Board of Canada assisted with processing the film while the Canadian Broadcasting Corporation sold her used editing equipment. When she needed a blow-up to 35mm, BC Film came to the rescue. This kind of common Canadian support, many would say over the weekend, is now in jeopardy with a national government not unlike the U.S.’s Republican Party. The idea of national identity was a component of a Saturday session with Oscar-winning cinematographer Guillermo Navarro (“Pan’s Labyrinth,” “Night At The Museum”). The Mexican native found common ground with many Canadian filmmakers in the room, expressing concern that artists must prove themselves in America to win validation at home. Currently based in L.A., Navarro is nevertheless proud of his heritage and what it taught him. Their collaborative relationship will continue soon, with Del Toro’s two-film adaptation of JRR Tolkein‘s “The Hobbit.” When pressed for details about those highly anticipated films, Navarro said with a smile, “It’s a military secret.” And, for the only time during the VIFF Film & Television Forum, a speaker was unable to share.